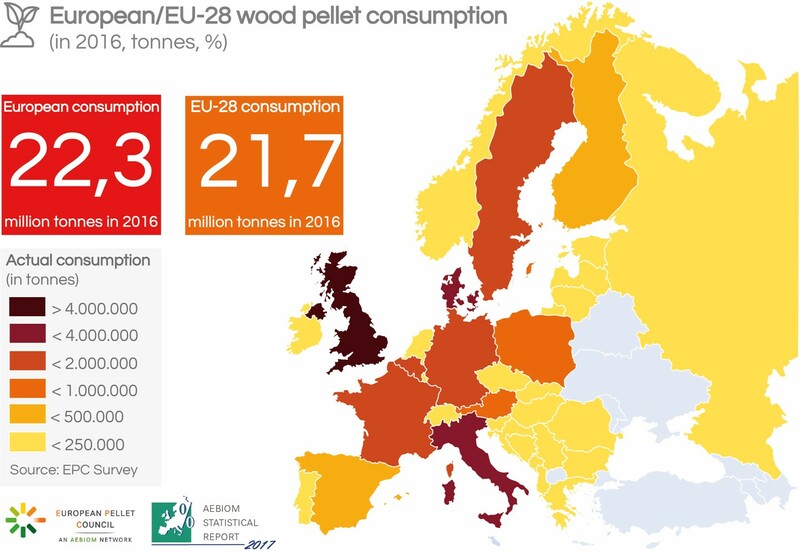 In the EU28, 21,7 million tonnes of wood pellets were consumed in 2016. The majority of the consumption went to heat production, representing 61,8%. 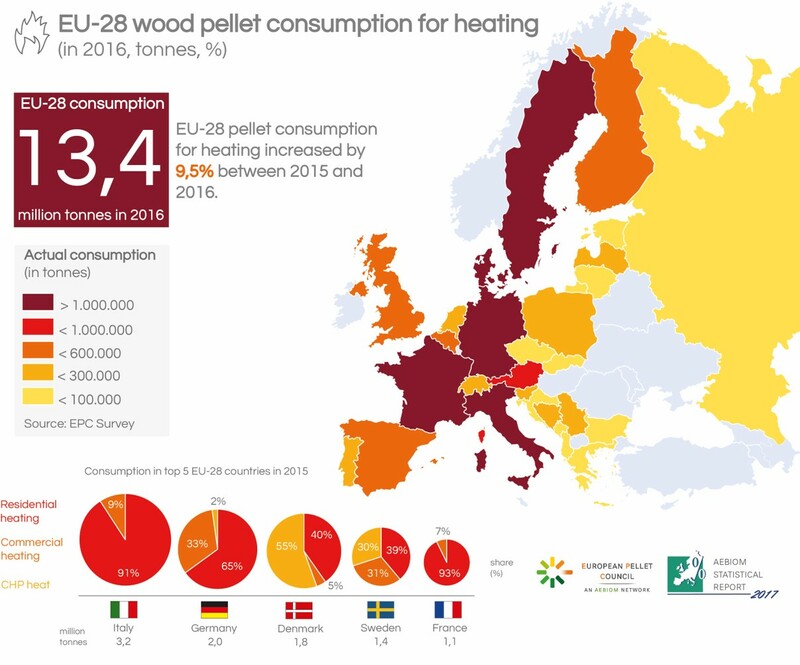 Pellet consumption for heat can be further divided into three markets – residential heating (69%), commercial heating (19%) and heat generated from CHP (12%). The remaining 38,2% of wood pellets were used for power production. It should be noted that the technologies for producing energy out of pellets for heat, electricity or both, are mature, offering efficient and reliable processes. The use of pellets for producing heat remained a strong sector in the EU, showing a noticeable expansion over the years. While the EU pellet for power market relies on policy frameworks, the EU pellet for heating market, which is less “support-dependent”, has shown to be stronger and more reliable. From 2013 to 2016, Europe experienced three consecutive mild winters, leading to a rather disappointing growth of pellet consumption in the heat market. Thankfully, the last heating season was colder, resulting in pellet use for heat (residential and commercial excluding CHP) showing a growth of 10,6% over the 2016-2017 period. This sudden rise in consumption generated some tensions in the supply leading to shortage in some areas and generating a price increase. 2017 volumes might even be more positive if Europe experiences at least a normal heating season 2017-2018. Despite this market recovery, the contraction of pellet heating appliance sales (especially domestic boilers) that can be observed in most Europe is concerning as this will impact the future growth of pellet sales. The use of pellets for electricity production (from CHP and dedicated power plants) in the EU28 has shown a slight decrease of 3,1% mainly due to the decrease in the use of pellets for power in the United Kingdom and a slight decrease of CHP in Denmark. The use of pellets for heat (from CHP, domestic and commercial appliances) remains a strong sector which had seen a slowdown in recent years due to warm winters. 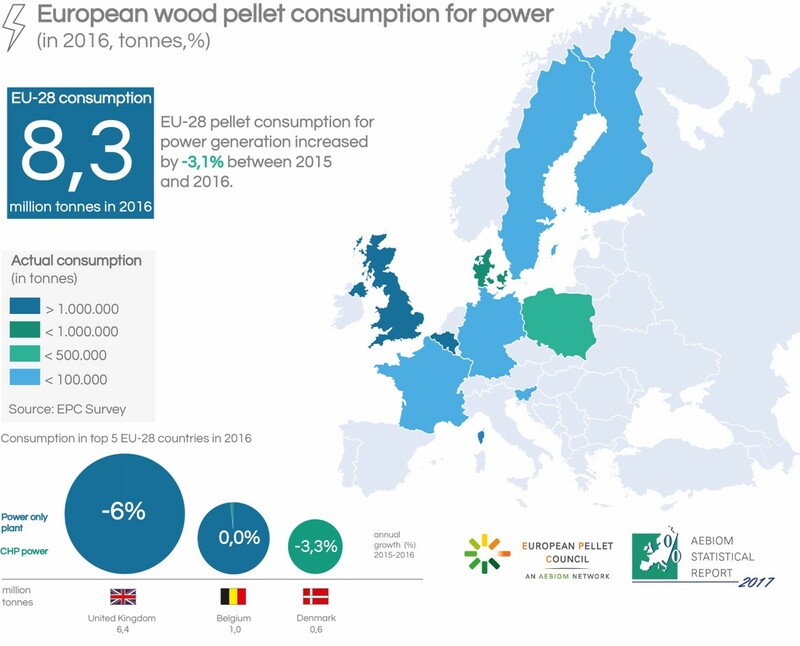 However, due to a winter colder than the previous ones, wood pellet use for the EU28 heat sector saw an increase of 9,5% between 2015 and 2016.